DheTemplate | New Free Blogger Template Everyday - Everyday Is New Free Blogger Template is galleries new free blogger template which provide blogger template for bloggers who want a profesional blogger template with a good design and layout include feature ready added for your blog. 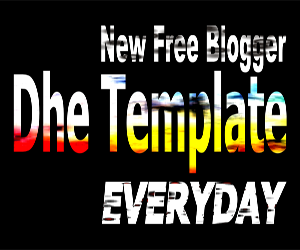 One things that make a different between DheTemplate and blog directories download free blogger template is a template makers don't need submit templates to us to because we'r coming to their templates. The template also really new because we subscribe their post via email so we can know if they make a new blogger template. Please attention. Even you can use these templates for free but you also have to respect their work. Create a beautiful and functional templates require a lot of time. So you are not allowed to remove or replace their existing links in the footer.